The product series contains 1 product. 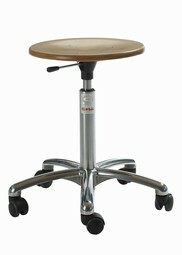 This stool is available with other type of seats and wheels. The vertical distance between the floor and the seat surface measured at the centre point of the seat. Measured with the seat as close as possible to the horizontal and the seat in the lowest position. The vertical distance between the floor and the seat surface measured at the centre point of the seat. Measured with the seat as close as possible to the horizontal and the seat in the highest position.